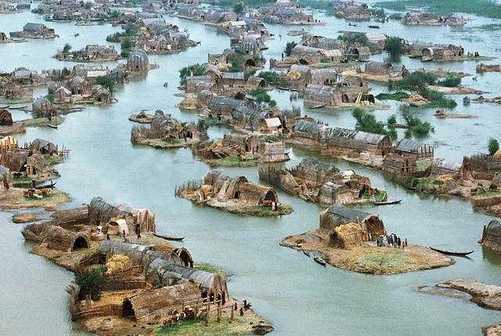 Mesopotamia Early Pioneers - HISTORY'S HISTORIESYou are history. We are the future. CLICK above to explore a timeline of Mesopotamian history. Why would anyone want to build a civilization in the middle of the desert in what is now lower Iraq? The answer: Because it was a wonderful place. Thousands of years ago, people began to settle along the banks of the Tigris and Euphrates Rivers. Natural wildlife and vegetation kept these early settlers fed while they began to build their new world. It was the end of the Stone Age and the beginning the Bronze Age, or the Age of Metallurgy, and Writing! Some of these early settlers, became the first people to build cities, and cities are an important trait of civilization. Review: What are two nicknames for Mesopotamia? This Sumerian cylinder seal shows a farmer in his orchard with domesticated sheep. It did not rain much, but the early settlers soon learned that if you irrigated the land, crops grew quickly. They built canals to bring water to the land from the rivers. They planted wheat, barley, dates, and other fruits and vegetables that included cucumbers, onions, apples, and spices. This abundance of crops led archaeologists to name Mesopotamia The Fertile Crescent. became a form of wealth. Pottery was traded for food, clothing, and jewelry. Sun-dried mud bricks like those used by the ancient Mesopotamians are still in use today. There may have been a small population of nomadic people in the area when these early settlers arrived. If so, the settlers quickly took over. They were real pioneers. They built permanent homes of sun-dried bricks made of mud and straw, and started a new life in the southern region of ancient Mesopotamia, a place called Sumer. The earliest people of Mesopotamia to develop a civilization are known as the Sumerians. About a thousand years later, the Babylonians took over in the south, and the Assyrians took over in the north, but the Sumerian culture lived on. Why is Mesopotamia called the "cradle of civilization?" These early pioneers, the ancient Sumerians, were very smart. They invented, among other things, the wheel, the sailboat, frying pans, razors, cosmetic sets, shepherd’s pipes, harps, kilns to cook bricks and pottery, bronze hand tools like hammers and axes, the plow, the plow seeder, a working battery, and the first written language, with which they recorded the story of the world's first superhero, Gilgamesh. Some Mesopotamian words are still in use today. Words like crocus, which is a flower, and saffron, which is a spice, are words we've borrowed from ancient Mesopotamia. King Hamurabi was one of the first rulers to have his laws written down. The Mesopotamians also invented a system of mathematics based on the number 60. Today, we divide an hour into 60 minutes, and a minute into 60 seconds. We owe that to the ancient Mesopotamians. Law held a special place in their civilization. There were always laws but, in time, Mesopotamian laws were written down. The ancient Mesopotamians were the first to have a written code of law. Mesopotamian laws clearly said how you had to behave and what your punishment would if you broke the law. The ancient Mesopotamians created a government that combined a monarchy with the rule of local councils that advised the king. Elected officials who served in the Assembly also ruled the people. Even the King had to ask the Assembly for permission to do certain things. You can see why we say that these were extremely clever people. We owe them a lot! How many Mesopotamian i﻿nventions ca﻿n you name?